Full line-up for the 2013 series; Karen Gillan's final interview; more. Paul McGann is the dark Doctor; exclusive interview with Arthur Darvill; more. Christmas issue; meet Clara; Matt Smith and Steven Moffat; includes 3 exclusive art cards; more. A tour of the new TARDIS; director Saul Metzstein on dinosaurs, snowmen, and the brand new series; more. Ages 9 and up. The Doctor explains some of the trickier concepts of time, space, Time Lord technology, and the mysteries of the universe. Full color photos throughout. Interviews with Catherynne M. Valente and Brian Slattery; 2012 year in review; Locus annual poll and survey; industry news, reviews, more. Articles about Michael Connelly, Nancy Springer, Joanna Carl, courtroom thrillers; reviews; more. As the doctor said, it's not so important what Miss Wansdyke died from as to whom she left a quarter of a million pounds. Inspector Sloan agrees. When Brandy and her mother Vivian win an abandoned storage unit's contents, the good news is a rare vintage cornet. The bad new is the recently stowed body of Big Jim Bob. When the duo finds another stashed victim, the hunt is on for the killer. Twenty-one short works of sf and fantasy. Ashe publishes a newsletter revealing the hidden treasures and secrets of the flying city of Amperstam - including many that the government doesn't want known. When she uncovers the horror of exactly how the city travels the skies, she finds herself on the run from thugs and assassins. Ages 13 and up. In the war-torn lands of the Drowned Cities, refugees Mahlia and Mouse have managed to escape the violence that plagues the main metropolis. But when they are confronted by soldiers from the United Patriotic Front, Mahlia must make a decision - risk everything to save Mouse, the boy who once saved her, or flee on her own to safety. A scholarly look at how science fiction forged a unique Russian vision of modernity distinct from Western models, embraced not only in literary circles and popular culture, but also by scientists, engineers, philosophers, and political visionaries. Ages 8 and up. The Wonderful Wizard of Oz: After their Kansas house is swept away by a tornado, Dorothy and her dog Toto find themselves in the strange land of Oz . Here they meet the Munchkins and join the Scarecrow, Tin Woodman, and the Cowardly Lion on a journey to the Emerald City, where the all-powerful Wizard of Oz lives. Can he help Dorothy return home? The Marvelous Land of Oz: Young Tip escapes from a witch and sets out to explore Oz. Along the way, he meets the Scarecrow and Tin Woodman, as well as new friends like Jack Pumpkinhead and the Wooden Sawhorse. Eventually, Tip's journey takes him to the Emerald City, where he realizes that his life will be changed forever. Ozma of Oz: Dorothy is sailing to Australia when a huge storm washes her overboard. She only survives by clinging to a chicken crate. Eventually she and Billina the yellow hen wash up on the magic shore of Ev, where they meet mechanical man Tik-Tok. Then Dorothy and Billina are taken prisoner by the evil Nome King, who has captured the royal family of Ev. Only Ozma of Oz can save them, but will she be in time? Ages 8 and up. Summer camp will never be the same, as twins Joules and Kevin attempt to thwart an invasion of sugar-addicted, murderous, seven-foot-tall rabbits from another galaxy. A graphic novel about her mother: voracious reader, music lover, amateur actor. Also a woman unhappily married to a closeted gay man, with artistic aspirations that simmered under the surface of Bechdel's childhood, and who stopped touching or kissing her daughter good night, forever, when Bechdel was seven. An Enchanted Village celebration is cut short when the cake delivery boy is found dead. Now his ghost has imprinted on Darcy - they're bonded until she can untangle the thicket surrounding his murder. Trouble arrives from Nate Romanowski's past, and it may be the battle of his life - and Joe's. Nate was in a secret Special Forces unit abroad, and a colleague did something terrible. Now that man is high up in the government, and out to eliminate anyone with knowledge of his wrongdoing. He'll strike at Nate's friends to draw Nate out - which makes the entire Pickett family a target. 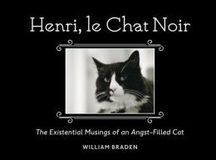 Through his short films and interactions with an enthusiastic online community, Henri the existential cat's contemplation of and disillusionment with the world has struck a chord with millions of fans, and his ennui has captivated people all over the world. This collection of Henri's musings features never-before-seen photos and quotes.